This is Paxlet’s last week of daycare before his summer holiday starts. Summer holiday is 8 weeks long (again) this year. After I have survived 8 weeks home with the kids, Tadbit starts daycare and I head back to work. I’m a bit torn over my feelings on this post title and the content to come. Yes, I know I wanted not one kid, but two and I have been extremely lucky to have them. However, with Paxlet quickly coming up on 3 years of age, he is a handful! He sometimes fights anything and everything I do or say and then screams or cries when something is done that he doesn’t approve of. Add on top of that the refusal to take a nap, even if it is needed, or even rest for a short bit, unless we are in the car then falling asleep is a given. Having him home these last 8 weeks from daycare has been totally exhausting! So, in that sense, I survived those times when he was screaming, crying and fighting me. I realize that people who have twins, or more, deal with more than one kid all day from the get go. I also realize that not all moms can or want to have their older kids in daycare while they are at home. For me, I have found it a godsend while I was getting my feet under me after having Tadbit. It helps that Paxlet likes his daycare lady and the kids. Plus they are able to play his extra energy out much better than I am. During the times he was happy, not screaming and we were working on things in the same direction, summer was great! We did quite many things at home and away from home. I enjoyed the good times. Paxlet is truly a smart, talkative (my ears are hanging on by threads) and sweet little boy that is growing up so fast. In “honor” of Paxlet heading back to daycare today, Tadbit and I had a restful day at home and I took a nap with her in the morning. Aaahh! Sleep! 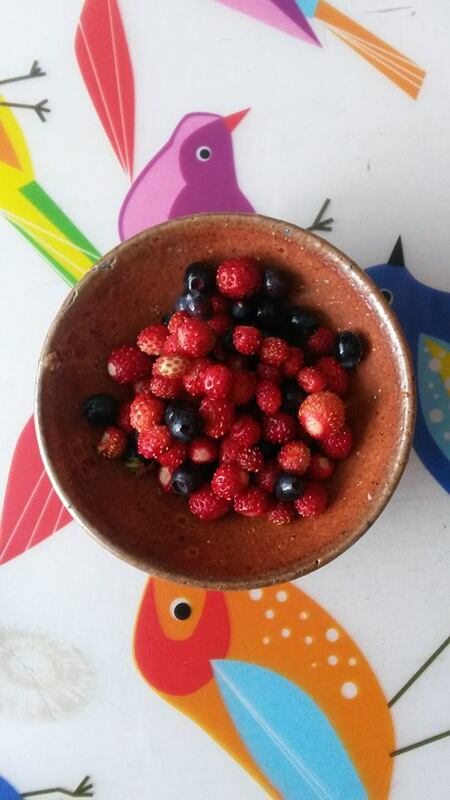 …collecting and giving all the berries you pick to your child instead of eating them yourself. To be fair, he picked some of those also and I did eat a couple while picking. I feel like my last post made it seem as if we are on the go go go and always doing something fun or exciting, which is definitely not the case. We have quite a bit of down time where we are just at home playing with Legos and other toys or outside in the yard and nearby areas. With 8 weeks of no daycare for Paxlet, we’ve got to find something to do to keep him entrained and not destroying the house. My little big boy, Paxlet, is 2 years 10 months. My little girl will be 3 months this weekend. Today was the first full day alone with the two of them. We had our challenges and a few unpleasant scenes, but overall it went decently well. I am however exhausted. Not that that is new. 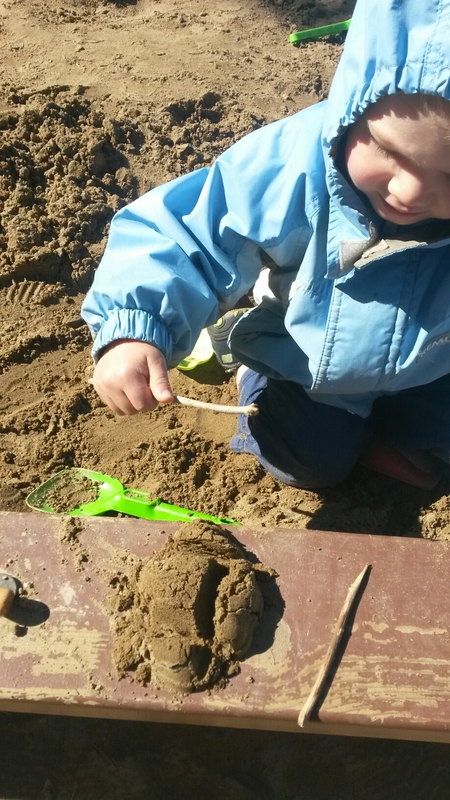 In the nearby park this morning we made sand cookies and cucumbers. 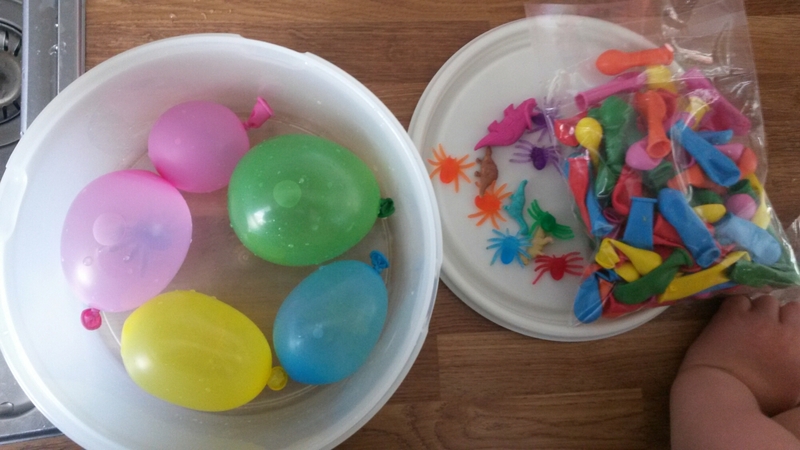 After lunch, we prepped a little something for tomorrow’s hot day: dinosaur and spider ice eggs. I saw this idea somewhere on the interwebs and just knew I wanted to do this once we got some warm and sunny days.